Head to Home Depot buy a punch of sheets of plywood. Roughly hang, have friends over, feed and booze them, and tada your own makeshift hole in the wall. I got nothing to add to the whole sharwarma and a kebab so I will end with nicely done! Meal Planner, the cabbage is different! I don't think I ever saw that, but I'm sure there are a gazillion variations. There was a place in SF near our apartment that sharwarma with fried potatoes inside. Don't know if that's an American thing or what, but it was good. Great submission. I love those streets vendors in Montreal. (I miss those now that I'm in BC). We don't seem to find them around. That must have been nice to live in Denmark for a while. manggy, interesting...I wouldn't have thought sharwarmas would be popular over there, what with all the other street food readily available. Helene, we don't get sharwarmas here in PDX either, at least I've yet to see a cart or stand anywhere. We do miss them and making them at home is just not the same. Yes, it was nice living in DK. It was one of the best experiences of my life and we really miss Copenhagen. At least we have reason to visit since all of Hubby's family is there. Maybe it's a regional thing? Like cola, soda, pop, Coke? There's quite a sizable Turkish population in Norway too. The kebabs were funnel-shaped. 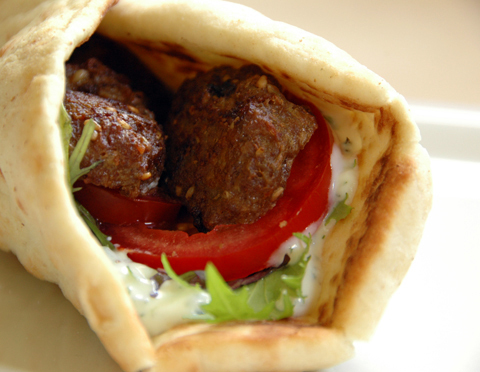 A pita cut open, stuffed with meat, sauce, chopped napa cabbage (b/c lettuce was a bit pricier? ), and drizzles of hot sauce. That was a long time ago, but since it was my first time really traveling, I try to eat a doner kebab wherever I go. Have eaten them in Amsterdam, Paris, London, and Stockholm. WC, you're the second to mention cabbage...interesting. I think you're right--the names are regional, but that doesn't make it any less confusing. Isn't it funny that in just about every Western European country, you could count on finding affordable, delicious sharwarmas? We ate them a lot when we were poor traveling students. ts, don't worry! You have until the 20th! I'm too busy to put up the roundup before then. Oh man, that looks fabulous. I'm not a big fan of lamb, but would love to try this with beef. Lamb with spices, my favorite! I think you just inspired my dinner! I was about to ask about Falafel, but then saw the link to your Falafel post. I guess Falafel is a veggie meatball version of kebab. Either way the kebab looks amazing with the tomato and yogurt sauce. I didn't know that the best time to eat kebab is at 3:00 am (haha), but I sure will keep that in mind. If anyone objects, I'll just tell them Darlene said so. Love kebabs. When I lived outside London we used to eat them all the time, along with Indian and other Middle Eastern foods. Different story in Seattle. BUT: I should be making my own. Thanks for the inspiration. As a lover of lamb in any form, I can tell you with certainty that these little treasures will appear on my table before the month is out. These sound delicious. I find your experiences and discussion of your time in Denmark fascinating. LC, London was such a great food city for "ethnic" foods, but British food, not so much (jellified eel??). I hear that's changing though. We keep saying we need to revisit, but then warmer climes always entice instead. Ted, thanks for the heads up. Mary, I really loved DK. Sounds so cliche, but I really learned a lot about the world outside the US. Oh my golly gosh that looks amazing. why do we need to pre-soak if using wood? anon, I like to pre-soak because the wood tends to burn otherwise. But if it's wet, it won't. Up to you, of course.